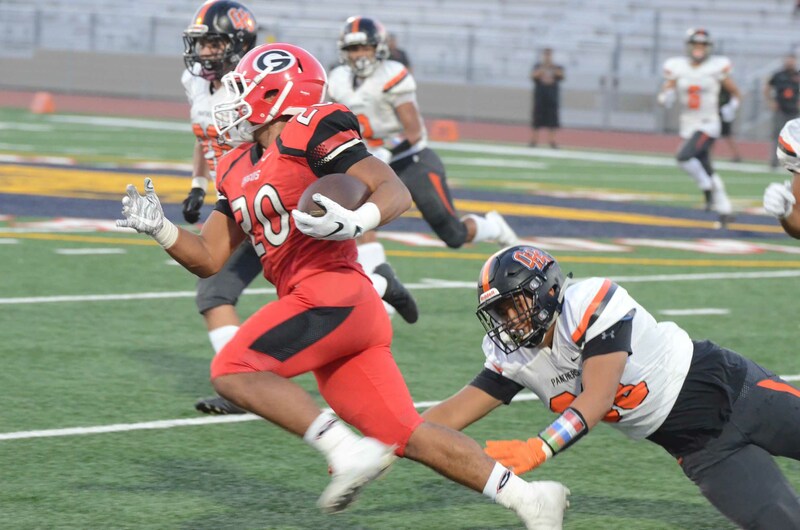 MIKE CARRILLO rushed for over 200 yards and two scores in Garden Grove’s 21-18 win over Orange High Friday night (Orange County Tribune photos by Jim Tortolano). Two of the more successful high school football programs in Orange County collided Friday night at Michael Monsoor Stadium in Garden Grove and the result was as close as expected. Garden Grove High’s Argonauts came from behind to post a 21-18 win over the Orange High Panthers in the season opener for both teams. Senior Mike Carrillo rushed for over 200 yards and two touchdowns, and had a 70-yard run late in the game that helped the red-and-white hang on to their lead. Orange came into the game as a team that had made it all the way to the state championship final last year. 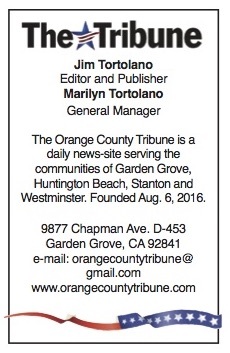 Grove has won so many Garden Grove League titles – and two CIF crowns – it was moved out of the GGL for this season. After a scoreless first quarter, Carrillo ripped off a 66-yard run around left end for a 7-0 Argonaut lead. 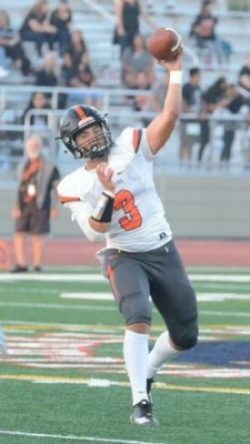 After Orange failed on a fourth down play, Grove got the ball back and drove down the field to the 12-yard line, where Argo quarterback Jacob Zazueta found wide receiver Shawn Haislip for a touchdown and a 14-0 lead. DAYLEN PEDROZA starred for Orange both as a passer and a runner (OC Tribune photo). Just before halftime, Orange put together its own drive, capped by a 40-yard field goal by Nick Guzman just as time ran out to make the score 14-3. The Panthers closed to within 14-11 after Dylan Moses capped a 56-yard drive with a 4-yard TD run – and a two-point conversion. Another OHS drive was spoiled by a fumble after a long completed pass, but the Argonauts had trouble moving the ball and the Panthers took the lead with six minutes in the game when Daylen Pedroza scored on a 1-yard dash, giving the visitors an 18-14 lead. It wouldn’t last long. Grove marched down the field to the Panthers 7-yard line, where Carrillo carried it in for what proved to be the winning score. Orange had its own star in Pedroza, who passed for 177 yards and rushed for another 76 yards and a touchdown. Andrew Andrade had 114 yards receiving. Orange (0-1) will look to bounce back against University High of Irvine next Thursday, while Garden Grove (1-0) will visit Santa Ana High on Friday.